Boone County Fiscal Court encourages TANK and Metro to consider updating existing policies to lessen financial and physical barriers associated with using both transit systems to access jobs. 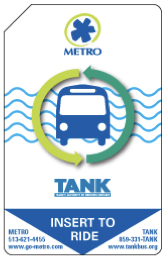 TANK and Metro implement policy updates once identified. The support for policy updates is proposed to be conducted within existing Boone County Fiscal Court administrative budget at no additional cost. Policy updates that would eliminate additional transfer fees between systems by reducing the price of Metro/TANK monthly passes are estimated to cost both public transit systems combined $330,000-$400,000 annually. Delivers a more socially- and economically-just regional transit service. Provides a more efficient and flexible transit service, thereby maximizing public and private transportation investments. Reduces door-to-door travel times and cost for all transit customers. Enhances Quality of Life for all transit customers. Increases the ability for employers across the entire OKI region to attract and retain employees by widening the regional pool of potential workforce candidates through increased accessibility. Helps to reduce Single Occupant Vehicle (SOV) travel and roadway congestion through increased transit usage. Coordination of two, independently run public transit agencies that operate in two different states of Ohio and Kentucky. Existing and future data identifies areas throughout Boone County experiencing congestion-related concerns and travel time delay due to high rates of SOV travel. Boone County already holds the title as the fastest growing county in the OKI region and Commonwealth of Kentucky. Boone County employee growth is projected to increase by over 20,000 people by 2040. For customers using both transit agencies, the Metro/TANK Express Monthly Pass is the highest pre-paid fare available. to all passes except Metro/TANK Monthly and Metro/TANK Express. Customers using both TANK and Metro service often experience multiple bus transfers, waiting times, and the longest-commute trips compared to other transit riders. Many customers do not have credit cards or sufficient savings to purchase the high monthly pass. Therefore, they purchase daily or weekly passes which add up to monthly transit expenses greater than $115.